It’s been a while, but the Omaha Pizza Review Crew is back. 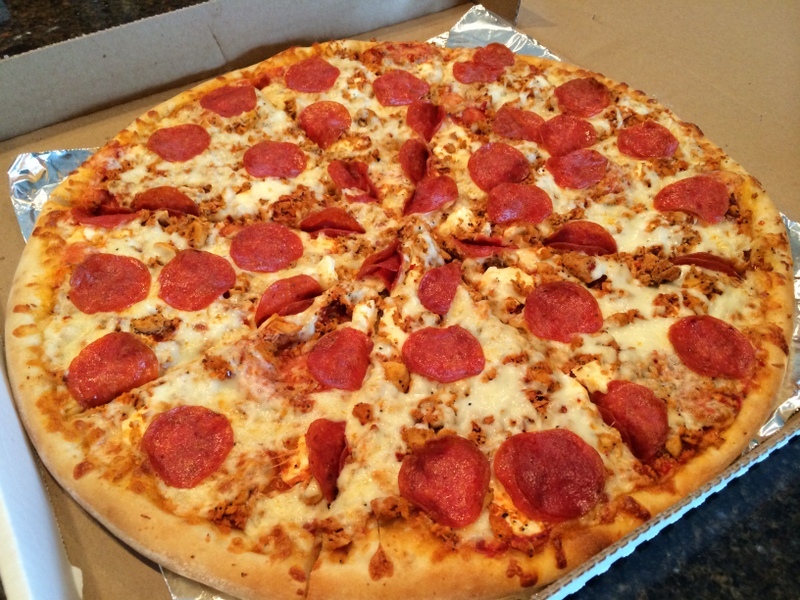 Our pizzeria of choice this time is relatively new to the West Omaha area, Piezon’s Pizzeria located on the South West corner of 156th and West Center Road. 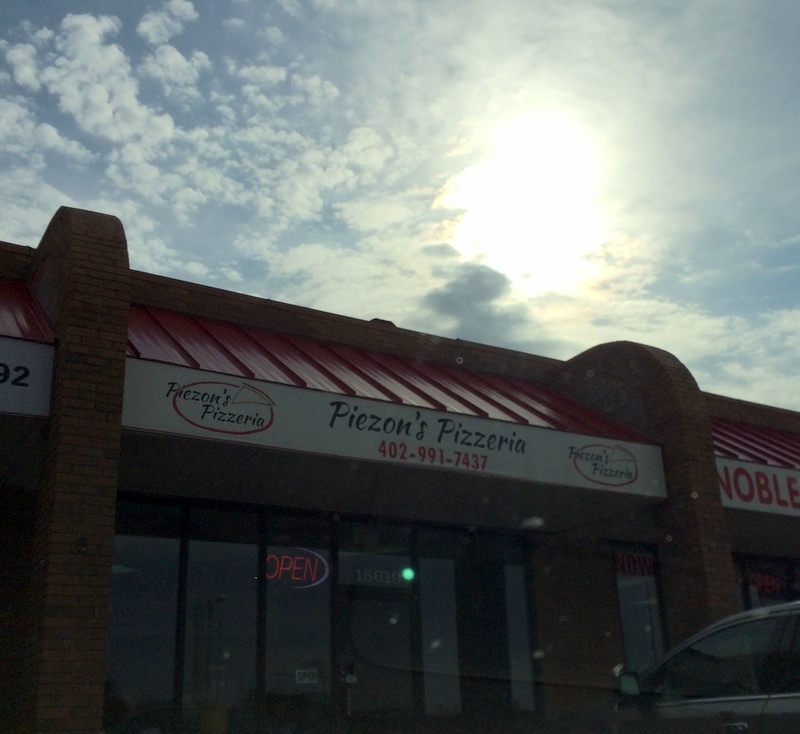 Piezon’s Pizzeria, located at 15619 West Center Road, occupies a single bay in a very small strip mall that thousands of motorists pass by everyday. Most probably don’t have a clue that Piezon’s is even there, and that’s a shame. Perhaps now that there is a giant gorilla statue standing at the entrance to the strip mall (a new King Kong restaurant is on the way), more people may take notice. Being located in such a small bay means no tables. It’s pretty much take-out only. I suppose you could eat a slice at the small counter located in the front of the joint on your lunch break, but most will order and go. Behind the counter you’ll find a friendly, shiney headed dough slinger who clearly runs the joint along with the gold standard for cooking pizzas in my opinion, a Blodgett deck oven. We ordered two pies on our visit, the first being the Oh Mio Dio (AKA The Big John), which interestingly enough, builds off another pizza, the Phoenix. According to the menu, the Phoenix is “Named after the fiery bird of mythology that rose from the ashes. This isn’t like any chicken you’ve had before. Our signature combination of spices has great flavor and just the right amount of heat.” To arrive at the Oh Mio Dio they add pepperoni and cream cheese. Yup. Cream cheese. And it’s delicious. Unfortunately after the first few bites my mouth caught fire. It’s spicy! I like a moderate amount of spice in my food, but even I found the Phoenix part of this pie to be a bit much for my taste. The one saving grace being the hunks of cream cheese to help douse the flames. Aside from the heat, the toppings and cheese were generous. The Farmers Market pizza the Wife ordered was true to description: green pepper, black olives, mushrooms, and onions.Piezon’s wasn’t stingy on the vegetables (yay for fresh mushrooms! 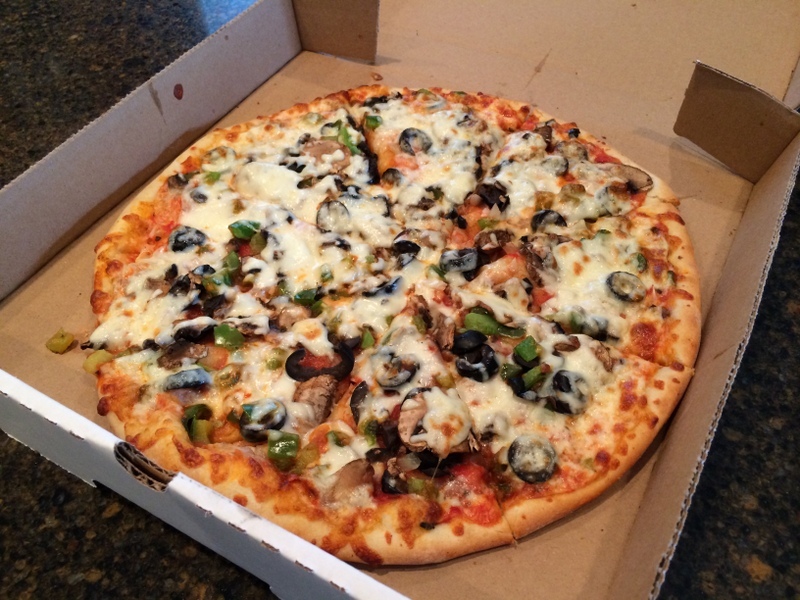 ), but like many pizza joints in the Omaha area, they absolutely piled on the black olives. There seemed to be more on the second pie we ordered (see update below); so many that the Pizza Wife ended up picking off most of them a couple of slices in because she got olive’d out. The crust wasn’t as crispy as she would have liked, but it held up well under all of the fresh ingredients. Both pizzas shared Piezons’ homemade dough and sauce. Their New York style crust is around ¼” in thickness with a solid, well formed edge. 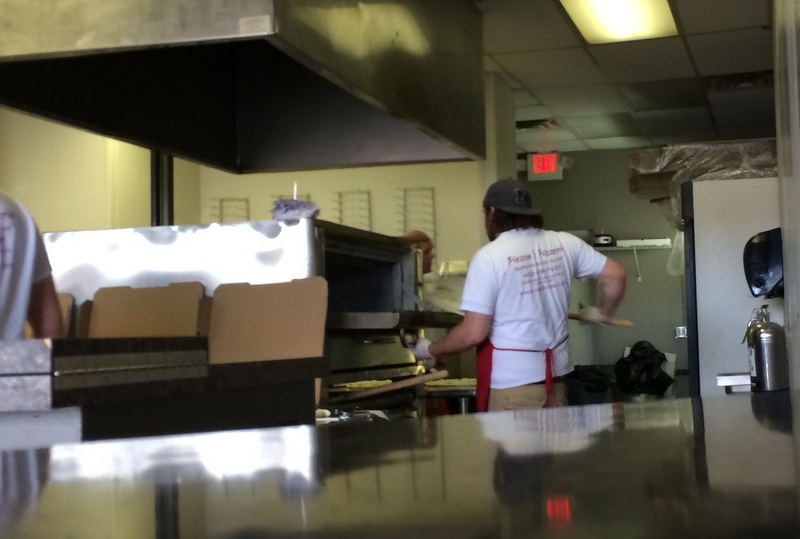 They assemble and cook their pies on pizza screens for the first half of their bake, then the pies are removed from the screens and placed directly on the deck of the oven to get the bottom to cook to perfection. The crust, while good, didn’t have the fight, or chewiness that you might expect from a that style of dough. Their sauce was equally as good and flavorful. It’s described on their site as containing “basil, oregano, garlic salt, and our secret ingredient”. I couldn’t figure out what that secret ingredient was, but we both liked it. Update: Since I pretty much ruined my taste buds on the The Big John on this visit, we decided to make a follow up visit to Piezon’s a week later to try something else. We ordered The Hos which as just about every meat on the menu, another Farmers Market and an order of cheesy bread. I mention the cheesy bread in particular here, since it’s served with a generous container of marinara sauce for dipping. I’m not certain that it’s the same sauce as they use for their pizzas, I don’t think it is, but we both found it to be quite salty. If it is indeed the same sauce used for their pizzas, the saltiness doesn’t overpower the rest of the pizza, but served alone it’s a bit much. Overall we’ve been very happy both times we’ve ordered from Piezon’s. They offer unique pizzas made with fresh ingredients that are sure to make everyone in the family happy. Since they are relatively close to home, they’re sure to be one of our goto places for pizza. We encourage you to try them out as well. Call ahead and grab some on your way home. Our pizzas have always been ready right when they said they would. The good: great taste, generous toppings. The bad: Be careful of the heat on the Phoenix! Salty marinara sauce. How would you rate Piezon’s Pizzeria? Click on the stars below! This entry was posted in Pizza and tagged Piezon's Pizzeria. Bookmark the permalink.